The JBL Link 10 is a jack of all trades but master of none. We love it for its Google Assistant, waterproof build and good sound for its size but were disappointed by its short battery life and slow boot up. Against the slightly more expensive competition, the Link 10 fails to stand out but it’s a good option if you don’t want to spend much on a smart, portable Bluetooth speaker. Smart speakers are all the rage these days but what if you want a single speaker you can use in the home and on the go? JBL has you covered with its Link line of speakers, which combine both smart and Bluetooth speakers into one product. At the low-end of JBL's Link line stands the entry-level JBL Link 10, a speaker that seems capable of doing everything on paper, but in practice has some issues. 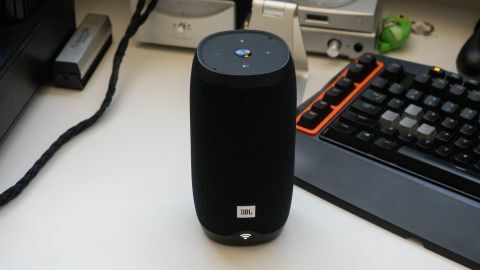 For the money, however, the $99 (£150, AU$230) JBL Link 10 offers plenty of bang for its buck: You get Google Assistant, Bluetooth, waterproofing and the ability to use at home and on the go. It can't rise above the competition in terms of battery life, but its convenience and audio performance make it a solid smart speaker and likely a better pick for most people than the original Google Home. The JBL Link 10 features the company’s iconic cloth housing and cylindrical design. The Link 10 only comes in two colors: black and white, which JBL probably limited the speaker to so that it doesn’t look out of place in the home. However, we wish there were more color options like with their other speakers like the JBL Flip 4. Aesthetically, the Link 10 blends into the background with its almost generic design, which is good of bad depending on your preference. Around the back you’ll find buttons for power and mute for the mic when you want some privacy, alongside a rubber door on the bottom to access the microUSB port which you'll use to charge the Link 10 in between sessions. On front of the speaker are four LED lights that pulse when Google Assistant is listening for a command. There’s also a LED wifi signal to let you know when the speaker is connected to your home network. The Bluetooth symbol on top will light up when it’s connected to your smartphone as well. The JBL Link 10 is IPX7 rated, which means you can fully submerge the speaker in up to a meter of water for up to 30 minutes. This is great peace of mind when you take the Link 10 outdoors to the beach or to a pool party. Bringing the speaker away from your Wi-Fi network will mean that you can't invoke Google Assistant by shouting "Hey, Google" but you can still use your phone's built-in assistant with a long press of the Play button as long as it's still paired via Bluetooth. Since the main draw of the JBL Link 10 is its Google Assistant support, let’s go over how that first. In terms of voice recognition, the Link 10 is decent but it’ll have trouble hearing your voice over loud music. There’s no fancy noise cancellation like you get with the Apple HomePod, but this shouldn’t be surprising considering the price and form factor. If you’re listening to music at soft to moderate volumes, it’ll hear your voice commands just fine. One thing that irked us was just how long the speaker took to boot up. It takes an average of about 20 to 30 seconds for the speaker to fire up and for us to start playing our tunes. Contrast this to Bluetooth speakers which fire up instantaneously and it’s a frustrating experience on the go. In terms of sound quality, the JBL Link 10 gets impressively loud, though there is some distortion at the upper end of the volume range. Tonally, the JBL Link 10 features a warm sound signature with your typical mid-bass bump. For the size, the Link 10 produces a good amount of bass but can’t compare to its bigger siblings like the Link 20 and Pulse 3. Highs have good extension but not very much detail. Battery life is rated at a disappointing 4 hours and our testing resulted in similar numbers. Unfortunately, putting Google Assistant into a portable speaker is definitely a compromise as it uses a lot of power. Compared to a purely portable Bluetooth speaker like the JBL Flip 4 which features 12 hours of listening, it’s disappointing that JBL couldn’t optimize Assistant to use less power, or to let users disable it for extended Bluetooth listening time on the go. If you’re looking for one speaker that works at home and on the go, the JBL Link 10 is a good choice given its affordable price. It sounds better than the aging Google Home and offers a flexible multi-room audio setup if you decide to add more Cast-enabled speakers from JBL or any other company. However, JBL has compromised on the battery life and sound quality compared to the competition. The UE Blast comes with Alexa onboard in a similar size but the Blast triples the JBL’s battery life with a total of 12 hours of listening. We also found the UE Blast’s sound quality slightly better as it offers fuller sound with a surprising amount of bass. However, Google Assistant is much better than Alexa at answering questions. That said, if you can afford an extra $50, we think you’re better off buying the JBL Link 20, which features 10 hours battery life and better sound.